Coconut Pecan Granola is lightly sweetened and loaded with delicious flavor. Serve it up as a snack, as cereal, or in a sweet, creamy parfait. I have a serious thing for granola and since starting my blog, I’ve definitely posted my fair share of granola-inspired recipes like this Pumpkin Pie Granola and this Apple Cinnamon Granola. Since I love sweet, crunchy snacks, granola is usually my go-to when the 3pm slump hits. Well, granola and a cup of coffee. I love snacking on it by the handful, but also love it with a generous splash of almond milk and in parfaits. And even though I am no stranger to buying granola from the market, I love whipping it up at home. 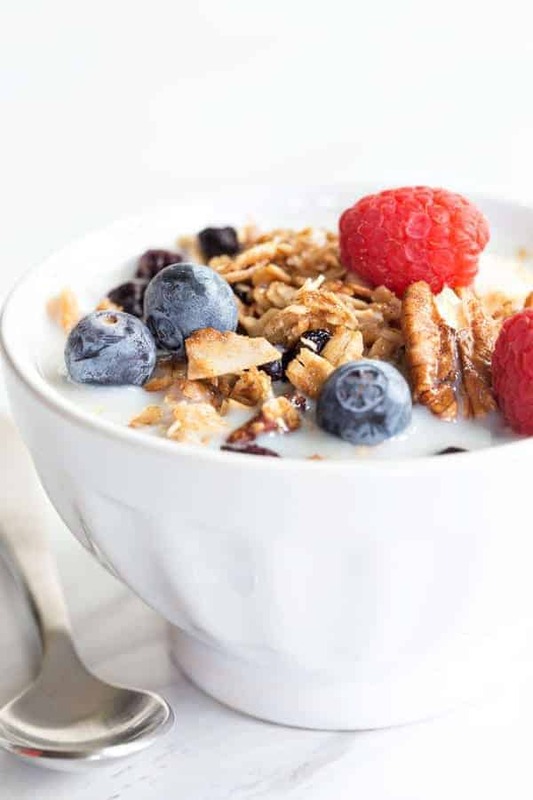 You can really customize homemade granola with so many different flavors and it’s a great way to use up leftover ingredients in your pantry. There are endless flavor combinations using items like dried fruit, spices, chocolate and of course – crunchy, heart-healthy Fisher Nuts. 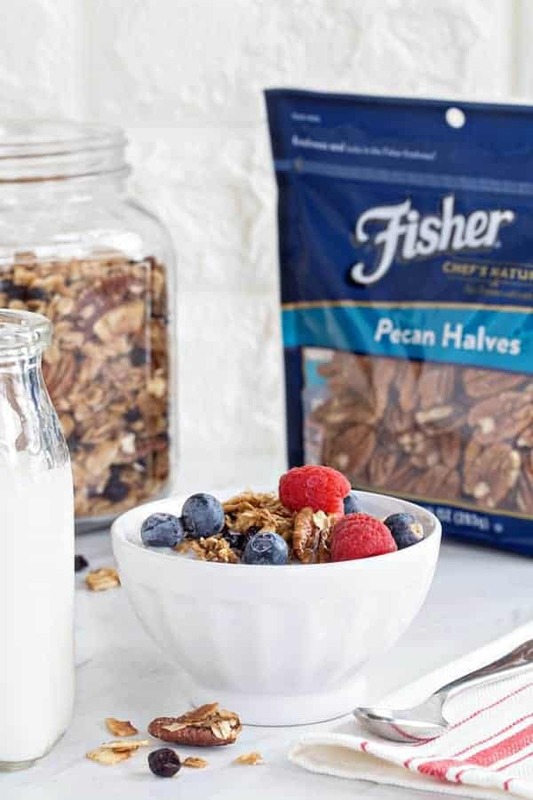 My favorite are Fisher Pecan Halves, but this granola would be absolutely amazing with walnuts, or almonds too. Elle has been getting progressively more finicky when it comes to breakfast food lately. Whenever we ask her what she wants, her response is simple: bacon. I tell ya, she’s a girl after my own heart. But since we can’t let her sustain life on bacon alone, we’ve been trying to get a little more creative. Think bunny shaped pancakes and smiley egg faces – complete with a strip or two of bacon, of course. There’s something about about a pretty layered parfait that gets her every time. Maybe it’s the slightly sweet Greek yogurt. Or yummy fresh berries. Or the irresistible, crunchy granola. Ha! Who am I kidding, it’s totally the promise of an episode of Paw Patrol once she’s finished. She may be encouraged by the promise of Paw Patrol, but I’m keen to load her up on homemade granola for more than just eat-less-bacon reasons. This Coconut Pecan Granola, as I mentioned, is chock full of Fisher Nuts Pecan Halves. How much do I love them for my family? They’re preservative free, and Non-GMO project certified. I love that I’m giving Elle pecans exactly as nature intended. There are nine different Fisher Nuts varieties certified Heart Healthy by the American Heart Association. That makes them good for the whole family. The resealable bag keeps all the different varieties I keep stocked fresh for longer. We go through nuts at a record pace around here, for snacking, baking, and parfait-making, but it’s nice to know I don’t have to worry about their freshness, or about finding an alternate container to store them in. 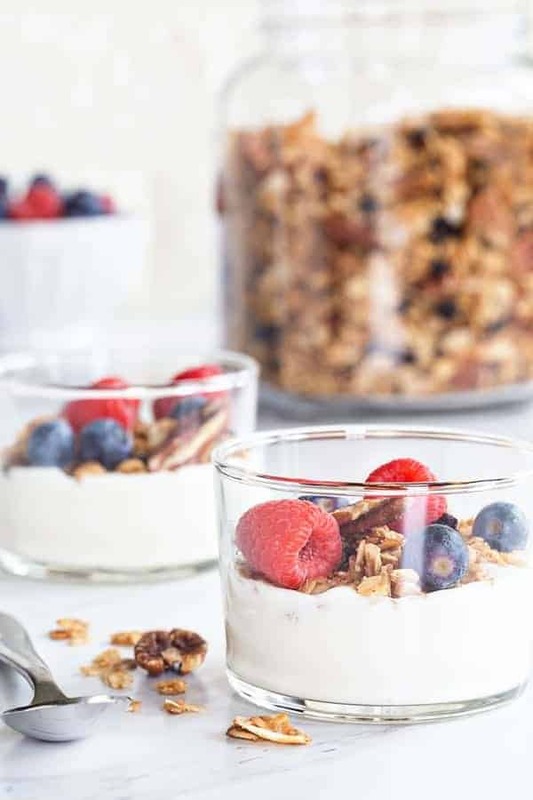 If your family loves nuts as much as ours does, you’ve got to make these Coconut Pecan Parfaits for breakfast this weekend. They’re the perfect brunch starter. Especially in beautiful bowls, next to a steaming cup of coffee. Preheat oven to 250°F. 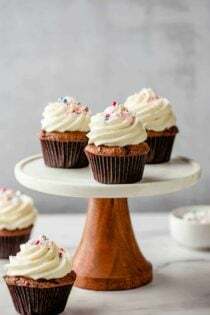 Line a large, rimmed baking sheet with parchment paper. In a large bowl, stir together the oats, pecans, coconut, cinnamon, salt and brown sugar. In a medium bowl, whisk together the honey and coconut oil. Pour honey mixture over oat mixture and stir until combined. Spread granola onto the prepared baking sheet. Bake in preheated oven for 60-75 minutes, stirring every 20 minutes or so. Allow granola to cool completely before adding in dried blueberries. 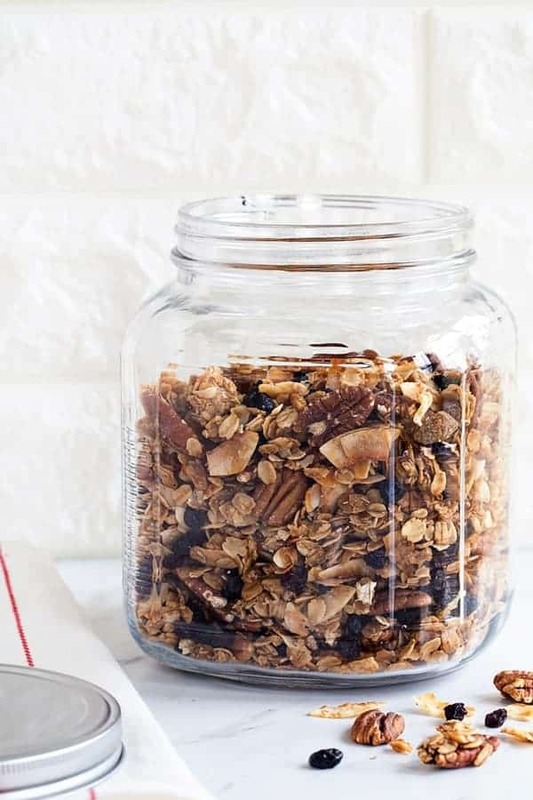 Store granola at room temperature in an airtight container. YUM! 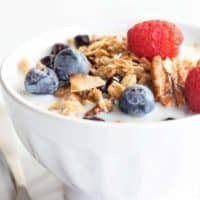 I love homemade granola and this one looks incredible! Thank you so much, Sienna! I love homemade granola and so does my family. Can’t wait to try this recipe. It is so good, Susan! I hope you enjoy it! This was the first time I tried homemade granola and it certainly won’t be the last! This is soooo much nicer than store bought! Actually is not even in the same league! As soon as I tasted it, I made another batch this time without the coconut and with maple syrup, 3 types of nuts and pumpkin pie spice. I kept tasting to see which one i liked better ;) You need to amend this recipe as follows …WARNING! ADDICTIVE! Thanks so much! God richest blessings to you and yours!